This article presents a model of apologies based on image maintenance that explains and illustrates the power of apologies in situations of conflict avoidance and resolution. A discussion of the function of apologies and their effective enactment draws on both empirical findings and actual apology events. A series of notable figures and events has piqued current interest in apologies2 and their role in conflict avoidance and resolution. A consciousness-raising has occurred in the US, recognizing that apologies are a "negotiable currency" (Shapiro 1997: 18) worth counting.3 Indeed, two entrepreneurs who founded a company in 1988 called "Apology Accepted" reported brisk sales for their three levels of Apologies: budget, moderate, deluxe (a 'budget apology' was cited at $100) (Darach / Young 1998). A web site bearing the name "Mark's Apology Note Generator" boasted over 10 million users since October 1995. Shapiro characterized the 1990s as "the current Age of Apology," (1997: 18), which Krauze (1998) proclaimed to be the successor to the Age of Aquarius. Others in the print media have variously referred to this "new age" in terms of "the current vogue for apologies" ("Mea Culpa" 1997: 19), "an excuse epidemic in America" (Tavris 1989: 116) and "this growing fashion of apologizing for what people did in the past" (Neuhaus 1998: 63). In light of the apparent recognition of the power of apologies, this article seeks to present a model for apologies along with related research on apology effectiveness in order to explain and illustrate this power as illustrated in actual apology events. Apposite to this explication is a consideration of findings regarding first language development of apologies. Before turning to the model of apology, an overview of people and events attracting recent interest in terms of apologies will be provided. Both popular and scholarly attention has been drawn to the importance of apologies. The following titles of several articles in the US press reflect the popular attention: "Go Ahead, Say You're Sorry" (Lazare 1995), "Mama Mia, That's a Mea Culpa" (Shapiro 1997), "Mea Culpa and All That" (Economist 1997), "Who's Sorry Now?" (Commonweal 1998), "World Leaders Vie to Say Sorry" (Ching 1998), "Never Apologise, Never Explain" (Krauze 1998),"Why Sorry Seems the Hardest Word to Say" (Time 1998), "A Sorry State of Affairs" (Tannen 1999). The focus in such publications involves apologies made by an array of public figures in the US. A list of "Who's Who" in this arena includes Alexander Hamilton (the first US Secretary of the Treasury), Jimmy Swaggart, Jim Bakker, Marv Albert, Gary Hart, Marion Barry, Richard Nixon, Bob Packwood, Dan Rostenkowski, Jerry Springer, Mike Tyson, Earl Butz, Marge Schott, and the most recent and most notable, Bill Clinton, who was cited as apologizing more than a dozen times between August 17, 1998 and September 11, 1998.4 Indeed, the Clinton-Lewinsky affair and the scrutiny given to the related apologies and their effectiveness, or lack thereof, underscores the potential power of apologies beyond "mere" politeness, as do other events in the political realm. Apologies for such events, many past and some present, what might be termed "surrogate confessions" (Ching 1998), have also received considerable attention. Some of the apologists and events include the following: the Vatican and the Holocaust; the Vatican and the Counter-Reformation; the Khmer Rouge leader Khieu Samphan and the deaths of Cambodians; Tony Blair and the Irish potato famine; the Queen of England and the seizure of Maori land; Bill Clinton and the slave trade (note, however, that this apology was made in Uganda, which was not part of that trade, rather than in West Africa, which was) ("Who's Sorry Now?" People 1998); Bill Clinton and the Tuskegee, Alabama syphilis experiments; Bill Clinton and the US provision of money to those engaged in the 1980s genocide of Mayans in Guatemala; Boris Yeltsin and the deaths of 15,000 Polish army officers in WWII; the Czech Republic and its expulsion of Sudetenland Germans; Rudolph Giuliani and a killing during the 1991 Crown Heights riots in New York City. Issues addressed in regard to such surrogate apologies involve their bureaucratic and impersonal nature, their sincerity or lack thereof, the judgment of national leaders on the basis of "their eloquence about past wrongs" rather than "on their present actions" (Krauze 1998: 4), their value in "confronting one's standards of behavior" ("Mea Culpa" 1997: 19), and the danger of an increased abdication of responsibility reflected in the proliferation of excuse-giving. Scholarly work has also addressed apologies. Murata (1998), for example, examines the 1995 letter of apology written by the then Japanese Prime Minister to the then British Prime Minister. The Southern Communication Journal offers two articles analyzing apologies made by public figures in the US: one, a former governor of Tennessee (Hoover 1989) and the other, John Brown (of the Harper's Ferry raid) (Burkholder 1991). Benoit (1997) uses the case of actor Hugh Grant (arrested for lewd behavior with a prostitute) to compare celebrity, political, and corporate image repair. Benoit and Brinson (1994) analyze the published apology made by Richard Allen, Chairman of AT&T, following a long distance telephone service interruption in New York in 1991. A large part of a 1991 book entitled Mea Culpa, by Nicholas Tavuchis, considers a number of political apologies illustrating those made by an individual to a collective group and by a collective group to an individual. Cross-cultural studies from varied fields have compared apologies in Japanese and US American English (e.g. Sugimoto 1998), Austrian German and US American English (Meier 1996), Italian and US American English (Lipson 1994), and Polish, Hungarian, and US American English (Suszczynska 1999) among others. Underlying all of the above work is the issue of the function of apologies and their successful enactment. In other words, what should an effective apology accomplish? This question will be addressed in the following section. S's image => S's linkage to a norm violation => S's damaged image => apology => S's repaired image. This view of apologies traces its lineage to Goffman (1971) and has been considerably influenced by subsequent developments in social psychology. According to this model, apologies repair the harm incurred to a speaker's image upon establishment of a link between that speaker and some sort of behavior that fails to meet the standards of a particular reference group (see Snyder, Higgins and Stucky 1983). This reference group likely includes or may even consist solely of the speaker (i.e. the apologist), as a person's violation of a norm may also pose a threat to her or his own self-image (cf. Snyder / Higgins 1986). Depicting the relationship between the apologist and the norm violation as a link also allows for cases in which the apologist takes responsibility for another's action (e.g. surrogate confessions). The damaged image incurs a divergence of the speaker's and hearer's "worlds" (cf. Aston 1988), which in turn signals a state of conflict. Apologies come to the rescue and repair the speaker's damaged image, thereby effecting a convergence of the speaker's and hearer's worlds. This convergence indicates a resolution of conflict, which serves a superseding goal of social harmony as it contributes to greater interactional equilibrium. The major motivating force behind an apology is thus the status of the speakers image in the eyes of the hearer, who is the arbiter of the appropriateness or effectiveness of particular apology strategies for a given situation. As such, apologies can be viewed as a type of rapport management (Spencer-Oatey 2000: 5).5 They reaffirm shared values and thereby reduce uncertainty, a critical factor underlying their use (see Berger / Bradac 1982), and assure membership in a group. This group membership confers a certain "power" on its members; effective apologies accrue concomitant power. This power has been shown to be a reality for both adults and children (Tedeschi / Reiss 1981, Ohbuchi, Kameda and Agarie 1989, Weiner, Amirkhan, Folkes and Verette 1987, Weiner, Graham, Peter and Zmuidinas 1991), and appears to be learned quite early in life, as will be seen in the following section. Apology studies conducted with children have generally been developmental in nature, precipitated by an interest in the overall socialization process. Focuses have thus been on apology production as it relates to cognitive maturation and concomitant changes in perceptions of responsibility, intentionality and self. In general, as children become more self-aware, are more concerned about what others think of them, and are increasingly able to take into account intentions and motives, their production and perception of apologies become more sophisticated. Although even kindergarten children have been found to have a basic understanding of responsibility and its consequences (e.g. if wrongdoing is controllable it elicits anger) (Weiner / Handel 1985) and to tailor excuses and justifications to fit different types of wrongdoing (Much / Shweder 1978), the following aspects of apologies have been found to increase with age: making amends (Graybill 1990, 1993; Sell / Rice 1988); externalizing causes for a wrongdoing (Graybill 1990, Schadler / Ayers-Nachamkin 1983); providing more elaborate apologies (Keller 1984, Sell / Rice 1988); being more sensitive to potential anger, and offering fewer controllable causes as excuses (Weiner / Handel 1985).6 The importance of friendship also increases as children reach adolescence, resulting in more excuses proffered to friends (Keller 1984), more elaborate apologies made to friends than to parents (Sell / Rice 1988), and a greater sense of violation by a friend than a classmate (Whitesell and Harter 1996). It has been further asserted that a child initially uses apologies to avoid punishment (Darby / Schlenker 1989; Schadler / Ayers-Nachamkin 1983). This subsequently evolves into protection of self-esteem, first in relationship to others and then in relationship to self (Schadler / Ayers-Nachamkin 1983). Likewise, as children mature, they also perceive apologies to be increasingly effective in reducing negative repercussions (e.g. dislike, punishment, blame) (Bennett 1990, Darby / Schlenker 1982, Ohbuchi / Sato 1994).7 Older children (e.g. 9-12 year olds as opposed to 5 or 6 year olds) also perceived more elaborate apologies to reflect greater remorse (Darby / Schlenker 1982). (Note that older children also use more elaborate apologies.) In short, it seems that children's apologies develop in line with a sense of self and the protection thereof as social acceptance (group membership) becomes increasingly important. There thus appears to be a development in apology behavior, which implies that some apologies are better than others in restoring a damaged image. The next section addresses the question of what constitutes a more effective apology. Hoover (1989) provides a general answer regarding the question of the effectiveness of apologies, attributing success to a match between the apology and its audience. Effecting such a match clearly entails a consideration of contextual variables (i.e. as constitutive of the social demands of a situation). Bennett and Earwaker (1994), for example, illustrate the importance of assessing both responsibility and outcome severity in any conflict resolution effected by an apology. Nonetheless, a review of research on apology effectiveness in US American English reveals some fairly consistent findings across a variety of contexts. There are basically two research approaches, in terms of data, in addressing the effectiveness of apologies. One approach uses actual or elicited apologies and (tacitly) assumes that those apologies that occur are, in fact, optimally effective. Studies in applied linguistics generally fall into this category, although most focus less on apology effectiveness per se than on identification of strategy types, their co-occurrence with contextual variables, and on cross-cultural differences (see e.g. Blum-Kulka, House and Kasper 1989, Meier 1996). The other approach involves experiments specifically designed to judge perceptions and effectiveness of contextualized apologies. This is the type of research reported below, which draws heavily on socio-psychological sources. The types of apologies investigated generally include Expressions of Regret, Confessions, Excuses (which argue for reduced responsibility), and Justifications (which seek to reduce the perceived negativity of the act, e.g. by appealing to a higher good) (Scott / Lyman 1968). 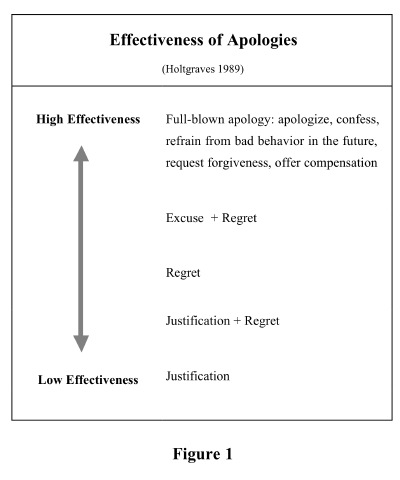 Table 1, for example, presents Holtgraves' (1989) list of most effective to least effective apologies as determined by respondents' rankings on four scales (i.e. hearer satisfaction; difficulty of use; helpfulness in solving conflict; likelihood of use) in three scenarios. This concurs with others' results in terms of placing excuses above justifications in effectiveness (e.g. Riordan, Marlin and Kellogg 1983, Cody / McLaughlin 1985, Gonzales 1992).8 Indeed, Snyder and Higgins (1986) view excuses to be a critical means of reality negotiation with regard to both oneself and others. Not every excuse is equal, however, as indicated by Weiner, Amirkhan, Folkes and Verette's (1987) four studies, which conclude with a distinction between "bad excuses" and "good excuses." Bad excuses involve reasons for a wrongdoing that depict it as intentional, controllable, stable, and internal. Such reasons would do little to assure the audience that the wrongdoing (i.e. norm violation) was not a true reflection of the values held by the apologist. Good excuses, in contrast, characterize the offensive behavior as unintentional, uncontrollable, unstable (i.e. temporary), and external. The results of Weiner, Figueroa-Munoz and Kakihara's (1991) three experiments with college students concerning false excuses (involving situation recall and imagining a situation) also support the characteristics of good excuses and bad excuses identified above. The authors further suggest that individuals possess a schema or model for a good excuse (cf. Cody / McLaughlin 1990), finding little variability or creativity in their data (i.e. the most prevalent false excuses were other commitments, work/study, parental interference). Ferrari and Beck (1998) likewise found that 75.5% of their procrastinating college student respondents reported using personal illness as a false excuse. Illness conforms to Weiner et al. 's (1987) characteristics of a good excuse as does a family emergency, which Caron, Whitbourne and Halgin (1992) found to be the only excuse offered more frequently as a false excuse than a legitimate one. Both illness and family emergencies are uncontrollable, unstable, unintentional and external. Furthermore, Caron et al. found that most college instructors accept excuses without verification, which underscores the effectiveness of excuses and likely encourages their further use. Gonzales (1992), in a study involving an offending confederate, also found the best excuse to be that which appealed to an unavoidable external circumstance, whereas blaming others or playing down the importance of a wrongdoing (i.e. a justification) did not yield positive impressions. Forsyth, Berger and Mitchell (1981) also, not surprisingly, found that respondents in their study received negative ratings when they blamed other members in their group for failure on a task. They also found, however, that an individual who accepted all the blame was not liked any more than one who allocated it evenly. Snyder and Higgins (1986) likewise concluded, on the basis of their literature review, that blaming others is "an exceedingly poor excuse strategy" (91). Another element of a good excuse is denial of intention.10 By arguing lack of intent, one affirms shared values by placing the blame for a wrongdoing on an uncontrollable force that interfered with the "right" intent (Meier 1992). Riordan, Marlin and Kellogg (1983) provided support for this apology strategy in a study in which a fictitious senator's character was perceived less negatively by respondents when he offered a denial of intent for his wrongdoings (i.e. bribery, soliciting a prostitute) than when he offered justification (i.e. arguing that his behavior served a higher good or that others would do the same in such a situation). It also seems that denying intent is of benefit in traffic court, at least in the greater Los Angeles area. In assessing 375 cases of oral arguments in traffic courts, Cody / McLaughlin (1988) found that only 30% of those using a denial of intention were fined, compared to 70-80% of those pleading lack of knowledge, mitigating circumstances, or illness/impairment. Weiner, Graham, Peter and Zmuidinas (1991), focusing on public confession, found that the timing of confession (i.e. expressing contrition, acknowledging personal responsibility, and making reparation) also played a role in effectiveness: a spontaneous confession, in contrast to one offered in response to an accusation, enhanced perceptions of a fictitious senator's character and guaranteed future co-operation. Benoit and Drew (1997), using a typology of 14 apology or image repair strategies, found mortification (i.e. direct expression of apology, concessions) and corrective action to be rated by their informants as most effective, with bolstering, minimization (i.e. a type of justification), provocation and denial to be the least effective. The authors importantly pointed out that apparent inconsistencies in results across studies regarding apology effectiveness can be attributed to different scenarios and different instances of a strategy type being used in different studies. Mortification and correction were also identified by Benoit and Brinson (1994) to be AT&T Chairman Richard Allen's strategies of choice following an interruption of long distance telephone services in New York in 1991. The employment of these strategies followed a mis-fired initial attempt to place the blame for the interruption on low level employees. Apology effectiveness in a much different setting than those heretofore considered, namely, in formal mediation, is addressed by Levi (1997), who suggests that cases involving personal injury and malpractice are especially good candidates for apologies, followed by employment disputes, if the issue of import is past loss rather than future opportunity. She finds that apologies are of little value in purely commercial matters, which lack a strong interpersonal element. In fact, she further suggests that apologies are generally more effective if the persons involved are sensitive to relationship issues. This is not surprising given a view of apologies that centers on image repair, which is clearly of greater import in interpersonal matters. An apology plus restitution (as opposed to restitution alone) is thus also better suited to cases where a potential for a future relationship exists. Tavuchis (1991) also points to a somewhat different evaluation of effectiveness in his focus on the different dynamics involved in interpersonal as opposed to collective apologies. He views sorrow and remorse to be the cornerstone of interpersonal apologies whereas documentation lies at the core of collective apologies. Such documentation consists of public acknowledgment, acceptance of responsibility, and an implicit or explicit promise that the behavior in question will not occur again. The fulcrum of apologies can thus shift according to the type of situation. Actual cases of apologies further support claims for their positive effects with some spotlighting the importance of confession, others regret, and yet others excuses. In returning to the list of "Who's Who" of apologists presented above, alleged wrongdoings range from biting to spending federal funds, state government corruption and excessive pardoning of prisoners, making a positive remark about Hitler, visiting a massage parlor, hiring a prostitute, telling a racist joke, sexual harassment, marital infidelity, cocaine possession, and a break-in cover-up. Only four of the eleven persons involved in the above cases suffered significant punishment. One of these four (i.e. Dan Rostenkowski, former chair of the US House Ways and Means Committee) did not offer an apology at all. Another, Marge Schott, who was finally forced to resign as managing partner of the Cincinnati Reds baseball team, only reluctantly and after much hesitation, offered a public apology; however, she did not express regret for her offensive words but rather for the offense they caused. The undoing of Ray Blanton, a former governor of Tennessee, is ascribed to his lack of consistency in vacillating between aggressiveness and humility in his apology behavior, thereby leading to diminished trust on the part of the public (Hoover 1989). In other words, his vacillation obviated any uncertainty reduction, a major motivation for apologies. In the case of former US president Richard Nixon, personal guilt was never acknowledged although a justification in the form of an appeal to a higher good was offered: "I regret deeply any injuries that may have been done ... if some of my judgments were wrong – and some were wrong – they were made in what I believed at the time to be in the best interest of the nation." This seems to support justification as a somewhat weak strategy (see above), at least if not accompanied by other apology strategies. Weiner et al. (1991) as well as Benoit and Brinson (1994) surmise that Nixon would have fared better had he told the truth and then asked for help and forgiveness. This is, in fact, what Bill Clinton finally did, and although caution must be exercised in solely attributing the different outcomes to apologizing strategies, the significant difference cannot be ignored, nor can the fact that Clinton repeatedly apologized after his statement from the Kremlin in which he admitted fault ("I made a mistake"), expressed regret, and promised to make amends. Thereafter he seemingly attempted to inject increasingly more remorse and sincerity into his apologies, inserting 'profoundly' before 'sorry' and on September 11, 1998, stating, "I have sinned", signaling a plea for forgiveness. These strategies seem to have been effective.11 Indeed, if one consults Holtgrave's effectiveness rankings of apology strategies (see table 1 above), Clinton finally succeeded in coming close to providing the components of a "full-blown apology." The only component not proffered was a promise not to repeat such behavior. It is possible that such a promise would have been ill-advised, lacking credibility in view of allegations of past behavioral patterns. The effectiveness of excuses discussed earlier may also have been diminished in this case as an excuse (i.e. a plea of reduced responsibility) either would not have been credible or would have made Clinton appear weak, presumably since abdication of responsibility and subsequent lack of control would not be in keeping with the image of the "the President." In fact, an excuse offered by his wife attributing Clinton's wrongdoing to his upbringing (i.e. diminishing his control and responsibility) clearly backfired and was not repeated. A similar result was found in a study by Weiner, Graham, Peter and Zmuidinas (1991), who found that a fictitious senator's denial of responsibility actually increased respondents' inferences of personal responsibility. Other public figures not appearing to suffer significant punishment (e.g. loss of position or long-term loss of income) also seem to have effectively employed apologies, even if viewed as partial (e.g. Jim Bakker) (Weiner, Graham, Peter and Zmuidinas 1991) or barely an apology at all, as in the case of former US Senator Bob Packwood, who said, "Am I sorry? Of course, if I did the things they said I did." Televangelist Jimmy Swaggart, upon being found with a prostitute for a second time, appealed to a higher judge, stating, "The Lord told me it's flat none of your business." People (1998, September 28) reports that Swaggart is still operating his own church and his sermons are aired in 30 countries. Blumstein et al. (1974) may shed some light on the continued acceptance of such public figures despite their use of less effective apology strategies, finding that respondents in their study judged the wrongdoings of lower status individuals in six vignettes more severely than those of a higher status person and that the accounts of higher status persons were also more likely to be honored. Benoit (1997) ascribes the effectiveness of Hugh Grant's apology (i.e. mortification, bolstering, attacking one's accuser) to his particular status as an entertainer. Snyder and Higgins (1986) also point out that apologies are especially likely to be accepted when the audience in some way identifies with the person apologizing. It was not rare to hear just such a comment in regard to Clinton's behavior, namely, that many US Americans could identify with his peccadilloes. Public acknowledgment is also an important part of surrogate apologies made to a group by representatives of countries or governments. Excuses, on the other hand, are less valued in such cases than they are in interpersonal apologies. Tony Blair, for example, offered no excuses for events surrounding the Irish potato famine, nor did Bill Clinton argue for reduced responsibility concerning the slave trade. Indeed, it would seem in bad taste for either to have offered excuses. Also noteworthy is US Americans' lack of acceptance of Austrian Kurt Waldheim's public excuse (when running for public office) of a memory lapse for the omission in his memoirs of his WWII involvement. For US Americans (in contrast perhaps to Austrians) an acknowledgment and acceptance of responsibility would have been more effective than an excuse, especially an internal excuse (see Meier 1996). Blumstein et al. (1974) conclude that our behavior appears to be less important than the interpretation assigned to it. Apologies, in assigning an interpretation to our misdeeds, assume a great deal of power. This power is mediated by the context and the relationship between the apologist and the audience. A major part of apology effectiveness thus lies in knowing one's audience and what it will deem appropriate and effective for a particular situation. Indeed, the right apology, in terms of context and audience, seems likely to be accepted, even if false. Words have power and apologies are a prototypical case, maintaining desired images in both public and private realms and serving as a valuable currency in avoiding or resolving conflict. Aston, Guy (1988): Learning Comity. Bologna: Editrice CLUEB. Bennett, Mark (1990): "Children's Understanding of the Mitigating Function of Disclaimers", in: The Journal of Social Psychology 130, 29–37. Bennett, Mark and Earwaker, Deborah (1994): "Victims' Responses to Apologies: The Effects of Offender Responsibility and Offense Severity", in: The Journal of Social Psychology 134, 457–464. Benoit, William L. (1997): "Hugh Grant's Image Restoration Discourse: An Actor Apologizes", in: Communication Quarterly 45, 251–267. Benoit, William L. and Brinson, Susan L. (1994): "AT&T: 'Apologies are not Enough'", in Communication Quarterly 42, 75–88. Benoit, William L. and Drew, Shirley (1997): "Appropriateness and Effectiveness of Image Repair Strategies", in: Communication Reports 10, 153–163. Berger, Charles R. and Bradac, James J. (1982): Language and Social Knowledge: Uncertainty in Interpersonal Relations. London: Edward Arnold. Blum-Kulka, Shoshana, House, Juliane and Kasper, Gabriele (eds.) (1989): Cross-Cultural Pragmatics: Requests and Apologies. Norwood, NJ: Ablex. Blumstein, Philip W. with Carssow, Kathryn G., Hall, Janet, Hawkings, Barbara, Hoffman, Ronald, Ishem, Ernest, Maurer, Caroll P., Spens, Dana, Taylor, John and Zimmerman, D. Lee (1974): "The Honoring of Accounts", in: American Sociological Review 39, 551–566. Burkholder, Thomas R. (1991): "Symbolic Martyrdom: The Ultimate Apology", in: The Southern Communication Journal 56, 289–297. Caron, Mark D., Whitbourne, Susan K. and Halgin, Richard P. (1992): "Fraudulent Excuse Making among College Students", in: Teaching of Psychology 19, 90–92. Ching, Frank (1998): "World Leaders Vie to Say Sorry", in: Far Eastern Economic Review (February 12), 34. Cody, Michael J. and McLaughlin, Margaret L. (1985): "Models for the Sequential Construction of Accounting Episodes: Situational and interactional constraints on message selection and evaluation", in: Richard L. Street Jr./ Joseph N. Cappella (eds. ): Sequence and Pattern in Communicative Behavior. London: Edward Arnold, 50–69. Cody, Michael J. and McLaughlin, Margaret L. (1988): "Accounts on Trial: Oral Arguments in Traffic Court", in: Charles Antaki (ed. ): Analysing Everyday Explanation: A Casebook of Methods. London: Sage, 113–126. Cody, Michael J. and McLaughlin, Margaret L. (1990): "Interpersonal Accounting", in: Howard Giles/W. Peter Robinson (eds. ): Handbook of Language and Social Psychology. New York: John Wiley and Sons, 227–255. Darach, Brad and Young, Stanley (1998): "Feeling Sorry but Can't Face the Music? ", Main Street, 133–134. Darby, Bruce W. and Schlenker, Barry R. (1982): "Children's Reactions to Apologies", in: Journal of Personality and Social Psychology 43, 742–753. Darby, Bruce W. and Schlenker, Barry R. (1989): "Children's Reactions to Transgressions: Effects of the Actor's Apology, Reputation and Remorse", in: British Journal of Social Psychology 28, 353–364. Ferrari, Joseph R. and Beck, Brett L. (1998): "Affective Responses Before and After Fraudulent Excuses by Academic Procrastinators", in: Education 118, 529–538. Forsyth, Donelson R., Berger, Rick E. and Mitchell, Tom (1981): "The Effects of Self-Serving vs. Other-Serving Claims of Responsibility on Attraction and Attribution in Groups", in: Social Psychology Quarterly 44, 59–64. Goffman, Erving (1971): Relations in Public. New York: Basic Books. Gonzales, Marti H. (1992): "A Thousand Pardons: The Effectiveness of Verbal Remedial Tactics during Account Episodes", in: Journal of Language and Social Psychology 11, 133–151. Graham, Sandra; Weiner, Bernard and Benesh-Weiner, Marijana (1995): "An Attributional Analysis of the Development of Excuse Giving in Aggressive and Nonaggressive African American Boys" in: Developmental Psychology 31, 274–284. Graybill, Daniel (1990): "Developmental Changes in the Response Types versus Aggression Categories on the Rosenzweig Picture-Frustration Study, Children's Form", in: Journal of Personality Assessment 55, 603–609. Graybill, Daniel (1993): "A Longitudinal Study of Changes in Children's Thought Content in Response to Frustration of the Children's Picture-Frustration Study", in: Journal of Personality 61, 531–535. Hale, Claudia (1987): "A Comparison of Accounts: When is a Failure not a Failure? ", in: Journal of Language and Social Psychology 6, 117–132. Holtgraves, Thomas (1989): "The Form and Function of Remedial Moves: Reported Use, Psychological Reality and Perceived Effectiveness", in: Journal of Language and Social Psychology 8, 1–16. Hoover, Judith D. (1989): Big Boys Don't Cry: The Values Constraint in Apologia", in: The Southern Communication Journal 54, 235–252. Keller, Monika (1984): "Rechtfertigungen", in: Wolfgang Edelstein/Jrgen Habermas (eds. ): Soziale Interaktion und soziales Verstehen. Frankfurt am Main: Suhrkamp, 253–299. Krauze, Andrjez (1998): "Never Apologise, Never Explain," in: New Statesman (May 29), 4). Lazare, Aaron (1995): "Go Ahead, Say You're Sorry", in: Psychology Today 28 (January/February), 40–45. Levi, Deborah (1997): The Role of Apology in Mediation", in: New York University Law Review 72, 1165–1209. Lipson, Maxine (1994): "Apologizing in Italian and English", in: IRAL 32, 19–39. "Mark's Apology Note Generator" (2003): available at http://net.indra.com/karma/formletter.html. Last visited 28.09.2004. "Mea Culpa and All That" (1997): in: The Economist 343 (June 21), 19. Meier, A. J. (1992): A Sociopragmatic Contrastive Study of Repair Work in Austrian German and American English. Unpublished PhD dissertation, University of Vienna, Austria. Meier, A. J. (1996): "Two Cultures Mirrored in Repair Work", in: Multilingua 15, 149–169. Much, Nancy C. and Shweder, Richard A. (1978): "Speaking of Rules: The Analysis of Culture in Breach", in: New Directions for Child Development: Moral Development 2, 19–39. Murata, Kumiko (1998): "Has He Apologized or Not"? : A Cross-Cultural Misunderstanding between the UK and Japan on the Occasion of the 50th Anniversary of VJ Day in Britain", in: Pragmatics 8, 501–513. Neuhaus, Richard J. (1998): "Apologies on the Cheap", in: First Things 4, 1. Ohbuchi, Ken-ichi, Kameda, Masuyo and Agarie, Nariyuki (1989): "Apology as Aggression Control: Its Role in Mediating Appraisal of and Response to Harm", in: Journal of Personality an Social Psychology 56, 219–227. Ohbuchi, Ken-ichi and Sato, Kobun (1994): "Children's Reactions to Mitigating Accounts: Apologies, Excuses, and Intentionality of Harm", The Journal of Social Psychology 134, 5–17. Riordan, Catherine A., Marlin, Nancy A. and Kellogg, Ronald T. (1983): "The Effectiveness of Accounts Following Transgression", in: Social Psychology Quarterly 46, 213–219. Schadler, Margaret and Ayers-Nachamkin, Beverly (1983): "The Development of Excuse-Making", in: C R. Snyder/ Raymond L. Higgins/ Rita J. Stucky (eds. ): Excuses: Masquerades in Search of Grace. New York: John Wiley and Sons, 159–189. Scott, Marvin D. and Lyman, Stanford M. (1968): "Accounts", in: American Sociological Review 33, 46–62. Sell, Marie A. and Rice, Mabel L. (1988): "Girls' Excuses: Listener, Severity of Violation, and Developmental Effects", in: Discourse Processes 11, 357–371. Shapiro, Walter (1997): "Mama Mia, That's a Mea Culpa", in: Time (June 30), 18. Snyder, C. R. and Higgins, Raymond L. (1986): "Excuse Attributions: Do They Work? ", in: S L. Zelen (ed. ): Self-Representation. New York: Springer Verlag, 53–132. Snyder, C. R., Higgins, Raymond L. and Stucky, Rita J. (1983): Excuses: Masquerades in Search of Grace. New York: John Wiley and Sons. Spencer-Oatey, Helen (2000): Culturally Speaking. London: Continuum. Sugimoto, Naomi (1998): "Norms of Apology Depicted in US American and Japanese Literature on Manners and Etiquette", in: International Journal of Intercultural Relations 22, 251–276. Suszczynska, Malgorzata (1999): "Apologizing in English, Polish and Hungarian: Different Languages, Different Strategies", Journal of Pragmatics 31, 1053–1065. Tannen, Deborah (guest ed.) (1999): "A Sorry State of Affairs", in: Civilization (April/May), 63–73. Tavris, Carol (1989): "No-Fault Psychology", in: Vogue 1, 116. Tavuchis, Nicholas (1991): Mea Culpa: A Sociology of Apology and Reconciliation. Stanford: Stanford University Press. Tedeschi, James and Reiss, M. (1981): "Verbal Strategies in Impression Management", in: Charles Antaki (ed. ): The Psychology of Ordinary Explanations of Social Behaviour. New York: Academic Press, 156–187. "The Prodigal President: Why Bill Clinton's Apology Misfired" (1998), in: Christianity Today 42 (October 5), 36. Weiner, Bernard; Amirkhan, James, Folkes, Valerie S. and Verette, Julie A. (1987): "An Attributional Analysis of Excuse Giving: Studies of a Naive Theory of Emotion", in: Journal of Personality and Social Psychology 52, 316–324. Weiner, Bernard; Figueroa-Munoz, Alice and Kakihara, Craig (1991): "The Goals of Excuses and Communication Strategies Related to Causal Perceptions", in: Journal of Personality and Social Psychology 17, 4–13. Weiner, Bernard, Graham, Sandra, Peter, Orli and Zmuidinas, Mary (1991): "Public Confession and Forgiveness", in: Journal of Personality 59, 281–312. Weiner, Bernard and Handel, Stephen J. (1985): "A Cognition-Emotion-Action Sequence: Anticipated Emotional Consequences of Causal Attributions and Reported Communication Strategy", in: Developmental Psychology 21, 102–107. Whitesell, Nancy R. and Harter, Susan (1996): "The Interpersonal Context of Emotion: Anger with Close Friends and Classmates", in: Child Development 67, 1345–1359. "Who's Sorry Now?" (1998): in: Commonweal (April 24), 5–6. "Who's Sorry Now?" (1998): in: People (September 28), 107–110. "Why Sorry Seems the Hardest Word to Say" (1998), in: Time 152 (September 14), 25. Yun, Kimo A. (1998): "Relational Closeness and Production of Excuses in Events of Failure", in: Psychological Reports 83, 1059–1066. Zeelenberg, Marcel, van der Pligt, Joop and Manstead, Antony S. R. (1998): "Undoing Regret on Dutch Television: Apologizing for Interpersonal Regrets Involving Actions or Inactions", in: Personality and Social Psychology Bulletin 24, 1113–1120. 1 This article represents a significant revision and expansion of my initial observations on conflict and apologies as presented in a paper at AAAL, Stamford, Connecticut, 1999. 2 'Apology' here refers to its broadest speech act sense, subsuming a variety of strategies, as opposed to a specific strategy (e.g. I apologize). 3 The popularity of apologies does not seem confined to the US if a Dutch TV show "I Am Sorry" is any indication (see Zeelenberg, van der Pligt and Manstead 1998). There was also a German version, "Verzeih mir!" [Forgive me!] which ran from 1992 to 1996 on RTL. 4 This number subsequently grew as Clinton continued to apologize to the American people as well as to his aides and to Monica Lewinsky. Lewinsky also publicly apologized to Hillary Clinton in a television interview. 5 Following Spencer-Oatey (2000: 12), rapport management involves the way language is used to construct, maintain and/or threaten social relationships…and includes the management of sociality rights as well as of face. As such, rapport management addresses the role of both self and other. 6 However, see Graham, Weiner and Benesh-Weiner (1995), who found that attributing wrongdoing to lack of controllable causes was not characteristic of boys identified as aggressive. 7 Whitesell and Harter (1996), however, found that apologies by peers (who were not friends) reduced emotional distress for pre-adolescents (11–12 years) but not for adolescents (13–15 years). 8 However, Hale (1987) found justifications (i.e. appeal to a higher good: job interview) to be more effective than other accounts, including excuses. The situation, however, in contrast to those in other studies, involved anticipatory rather than retrospective accounting. 9 Yun (1998) found, however, that greater intimacy negatively affected the number of good excuses. 10 The importance of intent, or lack thereof, is readily apparent in the US legal system, for example, in its distinction between involuntary manslaughter and premeditated murder. The role of intention and premeditation in degree of culpability is found in other legal systems as well. 11 An editorial entitled The Prodigal President in Christianity Today views Clinton's initial "grudging statement of regret" and blaming of others (e.g. independent prosecutor Ken Starr) as a loss of "his last shred of moral authority", thereby indicating the ineffectiveness of this "repair work" for this particular publication. The editorial concludes that "[t]here was no mea in his mea culpa"(1998: 36).